A day in Seattle provided a good layover as it provided much-needed rest after traveling across half of this planet. The long flight is enough to exhaust a person both physically and mentally. The temporary shelter provided a welcome relief. Golchand was on drop duty when I had to check out in middle of the night to reach the airport for an early morning flight to San Antonio. The lady at checkout was a chatty one and made sure I gave a detailed feedback for the facility before moving out. Golchand was a friendly and helpful driver. Paid 11$ per hour for an 8 hour night shift, the good guy guided me well for the next steps once he dropped me at the airport. After a 15 min drive through the darkness of the night, I was there at the Sea-Tac International Airport on an early morning of 18th April 2016. I was to board a United Airlines flight to San Antonio via Denver for going to my first destination in the United States. I was there on the check-in counters early enough to wait for an hour before the counters opened. As the staff trickled in, we moved into our places in the line and waited for our turn. Soon, I checked-in and got my boarding pass. One of my bags passed for carry-on but other had to be checked in which costed a baggage fee of USD 25. In US most domestic airlines only allow one carry-on with you and any checked in baggage needs to be checked in. Post this we moved to the security checkup. TSA was helpful as earlier and came out as a friendly authority with stern posture. They tried their best to convenience the passengers while ensuring that no security protocol was overlooked. You enter the security area after your identity and boarding pass is validated. At security, you have to take out laptops and belts and jackets and empty your pockets and pass through the X-Ray Scan machine. Before entering the machine, ensure you have nothing, not even a piece of paper, on you as the machine would give in a security alert. The process is fast and easy until you goof up like putting the laptop in the same tray as other stuff. Now they need to manually examine each of the stuff in that tray. Remember to have a separate tray for the laptop for smoother clearance. Then I proceeded to gate A12 which was quite a walk from the security checkpoint. I reached the boarding gate in time for boarding to start in 10 minutes. They announced that the flight was overbooked and offered a 500 USD voucher to opt for the next flight. However, in the interest of reaching San Antonio in time for time to explore the city before the rigors of training, I wasn’t tempted. There were a young girl and an uncle who opted for this and then we were good to go. They took my carry-on bag to carry it along with checked in luggage, complimentary service, so that aircraft's main cabin was not over-populated. I took my laptop case with me on the plane. They followed a zone-wise boarding which was smooth and convenient. This is another difference when compared to Indian flights that all US flights enforce such boarding protocols. As I entered the aircraft, I was pleased to observe that seats were good and wider than flights in India. The in-flight entertainment was different from the one we had on the American Airlines. One can use their own device to hook onto the onboard network and access the entertainment section on the intranet portal. Some movies could be viewed freely while some were paid. If required, Wi-Fi based internet access could be bought and accessed via a network. As the flight took off, the morning view of Seattle with horizons reddening with the first rays of the day, was a wonderful treat to eyes. The complimentary drink was served with a light snack and flight attendants were younger and friendlier. The flight went ahead smoothly and uneventful to large extent. In about a couple of hours, the captain announced the beginning of descent for Denver. A look through the window was enough to amaze anyone. The entire earth was covered by a thick layer of snow far and wide across the grounds. The forest of snow hills and troughs was creating a brightening illusion as the fresh rays of morning sun showered their energy on the ice crystals. Clouds flying across the sky with snow on the ground were glowing in the sun. Finally, the 2-hour flight ended as we landed in Denver amidst snow all around. What seemed like too short a time to change planes – I have 35 minutes of time between two flights and in India, one could never imagine doing that - was more than enough and I reached the gates early enough to wait for boarding. Gates for the same airlines are next to each other and no security screening is required while changing planes and this fastens the entire process. Denver was one of the hubs for United and hence was a pretty big airport with a long expanse of boarding gates. It was a good short stayover at the Denver Airport before we took off for San Antonio. The flight was mostly uneventful but for few turbulent patches and we landed in San Antonio on time half an hour to noon. San Antonio’s was a much smaller airport compared to others I had been on the trip. I moved to the baggage collection and collected both the checked in and carryon bags. After this, I moved to the taxi lane which required a few minutes of wait. Since I was new there, Uber was still a couple of days to be active (needed a US number for that). Soon I was in a Yellow Cab SUV, zooming out of the airport for Grand Hyatt which would house us for the first half of the stay here. Actually, the training was being conducted at this hotel so the organization team had booked us all for convenience and logistical ease. A 25 dollar fare with a 5 dollar tip got me to the hotel well before evening. I checked into my room – a twin bedded guest room on the 17th floor of the building, the second highest floor of the hotel. I had made a request for higher floors earlier and they allotted the room accordingly. The call in to make that request was worth the effort if one loves the view that was on offer. The entire downtown was right in front of my eyes with buildings, river, and roads – all ready to introduce me to this beautiful town of Texas. The hotel itself was situated at a great location with the river passing just beside the hotel and was the tallest building around the area. The room had a nice setup and was well equipped with everything one may need during travel. Interestingly they gave me a twin bedroom – I had no option neither qualms about this. Coffee was complimentary as were usual toiletries but the water was not. They gave a couple of welcome water bottles and then it was over 4$ for each liter. I decided to stock water bottles from the grocery store. I settled in the room and adjusted luggage at places convenient to pick up stuff. After an hour or so of sleeping in and refreshing myself, I was ready to head out. This was a new city I was in, a new corner of the world for me, and I was not going to waste an entire evening sitting out in my room. The world is meant to be explored and I was already up for it. So I picked my camera, slipped in a light jacket and moved out of my room. San Antonio, nicknamed as the Alamo City, is considered as the Heart of Texas by many. The city has been at the center of illustrious past and has gradually developed into a cosmopolitan center. It, to a large extent, symbolizes the rich heritage of the state of Texas. Though the city now has as large a population as the capital Dallas and is headquarters for five major military installations, yet it maintains its small-town flavor. As large in population as the bustling Dallas, San Antonio retains its small-town flavor while serving as the headquarters for five of the country's major military installations. Besides government, the city's third-largest industry, trade, high-technology services, and tourism also profit the local economy. 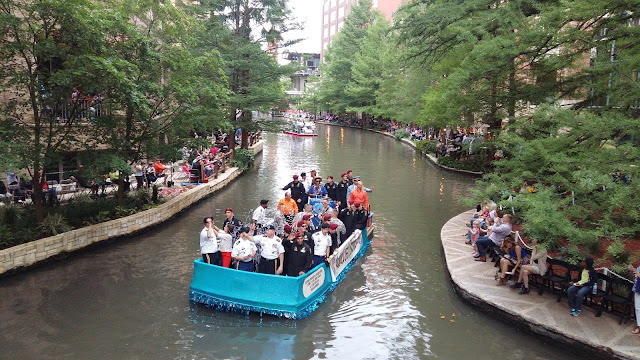 This city is one of the major tourist attractions for visitors coming to Texas who are looking for a relaxed time in the lap of nature, art, and culture. The city's meandering River Walk, the eighteenth-century Spanish missions, and of course, the Alamo, is of special interest to tourists. The coexistence of the old and new is something that adds a unique charm to this townish-city. As I interacted with the reception lady and went out for a stroll across the city, I realized that the main part of the city had limited expanse and most of the places were a short walk away. Macy was right across the street and The River Center mall was a short walk from the hotel. I went for a relaxed walk along the waters of the river. On the way, I saw the Alamo and Hotel Menger. I passed through the River Center Mall for a cursory look. It was a beautiful city bustling with activities for some reason. I stopped by at a junction and interacted with the cop on duty to understand what the hustle was all about. It was then I knew that this was a special time for the city as it was the “Fiesta Fortnight”. Fiesta San Antonio, previously called Fiesta San Jacinto, is a ten-day festival held every spring in San Antonio. It originated in the 1891 flower parade conceived by Ellen Maury Slayden, wife of Congressman James L. Slayden, as an April 21 salute to the heroes of the battles of the Alamo and San Jacinto. Fiesta is the Party With a Purpose. The funds raised by official Fiesta events provide services to San Antonio citizens throughout the year. The traditional commemoration still takes place, but for more than a century, Fiesta has grown into a celebration of San Antonio’s rich and diverse cultures. In the evening we attended the parade – the attraction of Fiesta 2016 – a great demonstration of party spirit of Texas. Carefully dressed personnel from various military, social and other organizations passed through the entire river area on nicely decorated boats. Each boat was lively in itself with music, lights, and dance. People were really in it to enjoy themselves to the fullest. Later we called it a day with dinner at a Sandwich place – WhichoWich – at the Mall. This was the first day in the city and the experience until now was nothing short of extraordinary. However, this was just a trailer for all that the city had to offer and we were committed to exploring the entire city over the course of next week. Stay hooked for the next article which takes you through the rich heritage of art, culture and scenic beauty that the city offers to its visitors. Do let me know your views in the comments and in case you need suggestions for any planned trip to the city, do let me know. I gather that you are married and are a high flying consultant. How do you find time for writing such detailed blogs? Ever thought of making some vlogs (video blogs) and uploading them? Should be fun! Yeah am married and a consultant (high flying is kind of tricky to claim). Finding time is about priorities and support. It happens that a part of me that impressed my wife was this blog and so she is the one who nags me to keep it going. About vlogs - I have quite a few videos that are hosted on YouTube and embedded as part of the posts. Unfortunately this one does not have one yet, but would soon have!! And yeah, thanks for visiting and offering such kind words appreciating the effort. It is another things that keeps me going.